These cloth bound rinded cheeses are made by stirring the curds in an open vat. The unique flavour comes from the lipase enzymes that are added to the milk, and this matures to give a strong aroma and taste. These hard cheeses are excellent for shaving or grating. 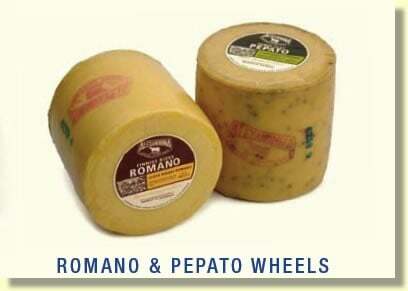 Romano, a close textured Italian style table cheese made from reduced fat Jersey milk. Pepato, a piquant peppercorn infused Romano style cheese, with a mild pepper flavour profile.